NCERT Textbook Solutions are considered extremely helpful when preparing for your CBSE Class 9 Mathematics exams. TopperLearning study resources infuse profound knowledge, and our Textbook Solutions compiled by our subject experts are no different. Here you will find all the answers to the NCERT textbook questions of Chapter 1 - Number Systems. All our solutions for Chapter 1 - Number Systems are prepared considering the latest CBSE syllabus, and they are amended from time to time. Our free NCERT Textbook Solutions for CBSE Class 9 Mathematics will strengthen your fundamentals in this chapter and can help you to score more marks in the examination. Refer to our Textbook Solutions any time, while doing your homework or while preparing for the exam. (i) True, since collection of whole numbers contains all natural numbers. (ii) False, integers include negative of natural numbers as well, which are clearly not whole numbers. For example -1 is an integer but not a whole number. (iii) False, rational numbers includes fractions and integers as well. For example is a rational number but not whole number. Concept Insight: Key concept involved in this question is the hierarchy of number systems Remember the bigger set consists of the smaller one. Since Mathematics is an exact science every fact has a proof but in order to negate a statement even one counter example is sufficient. (i) True, since real numbers consists of rational and irrational numbers. (ii) False, Since negative integers cannot be expressed as the square root of any natural number. 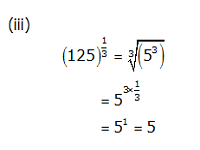 (iii) False, real number includes both rational and irrational numbers. So every real number can not be an irrational number. Concept Insight: Mentioning the reasons is important in this problem. Real Numbers consists of rational and irrational numbers and not vice versa. Every real number corresponds to a point on number line and vice versa. Recall real number includes negative numbers also. Square root of negative numbers is not defined. Square roots of all square numbers are rational. Concept Insight: In general only the square root of a prime number is irrational. Therefore square root of perfect square numbers are rational. Taking positive square root we get 1. Mark a point 'A' representing 2 units on number line. 3. Now taking O as centre and OB as radius draw an arc, intersecting number line at point C.
4. Point C represents on number line. [length (OB) = length (OC)] Concept Insight: For a positive integer n, can be located on number line , if is located using Pythagoras Theorem . If is a perfect square then this method is useful. To represent the irrational number key idea is to use Pythagoras theorem and create a length of units by constructing a right triangle of base and perpendicular of length 2 and 1 units. Concept Insight: The decimal expansion of a rational number is either terminating or non terminating recurring. Decimal expansion terminates in case the prime factors of denominator includes 2 or 5 only. 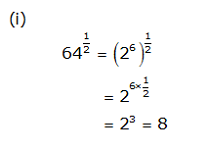 Yes it can be done as follows: Concept Insight: Multiples of the given decimal expansion can be obtained by simple multiplication with the given constant. Cross check the answer by performing long division. Concept Insight: The key idea to express a recurring decimal in the p/q form is to multiply the number by the 10n where n = number of digits repeating. Concept Insight: .9999999 ..... is nothing but 1 when expressed in p/q form. There are 16 digits in repeating block of decimal expansion of . Concept Insight: Maximum number of digits that can repeat will be 1 less than the prime number in denominator. Terminating decimal may be obtained in the situation where prime factorisation of the denominator of the given fractions are having power of 2 only or 5 only or both. Concept Insight: A rational number in its simplest form will terminate only when prime factors of its denominator consists of 2 or 5 only. Concept Insight: Recall that a non terminating non recurring decimal is an irrational number. Answer to such questions is not unique. As decimal expansion of this number is non terminating recurring so it is a rational number. (v) As decimal expansion of this number is non terminating non repeating so it is an irrational number. Concept Insight: A number is rational if its decimal expansion is either terminating or non terminating but recurring. A number which cannot be expressed in p/q form is irrational. Square root of prime numbers is always irrational. 3.765 can be represented Concept Insight: Divide the number line between the number to be represented in 10 parts starting the whole number part. = 4.2626 We can visualise 4.2626 as in following steps Concept Insight: Divide the number line between the number to be represented in 10 parts starting the whole number part. (i) As decimal expansion of this expression is non terminating non recurring, so it is an irrational number. (ii) It can be represented in form so it is a rational number. (iii) As it can be represented in form, so it is a rational number. (iv) As decimal expansion of this expression is non terminating non recurring, so it is an irrational number. (v) As decimal expansion is non terminating non recurring, so it is an irrational number. Concept Insight: Do the simplifications as indicated and see whether the number is terminating, non terminating recurring or neither terminating nor repeating. Remember Sum/difference/Product of a rational and irrational number may or may not be irrational. Concept Insight: Apply the algebraic identities (a+b)2, (a-b)2,(a+b)(a-b) etc to simplify the given expressions. There is no contradiction. Since here circumference or diameter are not given to be integers . When we measure a length with scale or any other instrument, we only get an approximate rational value. We never get an exact value. c or d may be irrational. So, the fraction is irrational. Therefore, is irrational. Concept Insight: A rational number is the number of the form where p and q are integers. In c and d are not integers. Also remember that no measurement is exact. (i) Mark a line segment OB = 9.3 on number line. (ii) Take BC of 1 unit. (iii) Find mid point D of OC and draw a semicircle on OC while taking D as its centre. (iv) Draw a perpendicular to line OC passing through point B. Let it intersect semicircle at E. Length of perpendicular BE = . ED2=EB2+DB2 Using Pythagoras theorem Concept Insight: This method based on the application of Pythagoras theorem can be used to represent root of any rational number on the number line. The key idea to represent is to create a length of units. Concept Insight: Express the number in exponent notation and use the rule Exponent m must be such that it is divisible by n.
Concept Insight: Express the number in exponent notation and use the rule of exponents. TopperLearning provides step-by-step solutions for each question in each chapter in the NCERT textbook. Access Chapter 1 - Number Systems here for free.